Okay, I know, this post may look a little familiar. But trust me, it’s different. Why? you ask. Well, here’s the deal. Few desserts sing of summer as beautifully as strawberry shortcake. 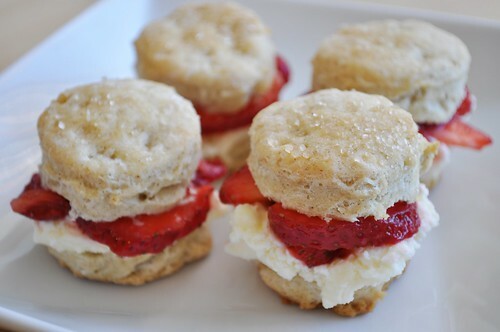 And with as well as those biscuits turned out, it’s been hard not to want to share the shortcake love with everyone I know. The initial recipe would be perfect for small gatherings–a backyard barbecue with the neighbors, a low-key cookout with one or two other couples, a relaxed night in with the fam. 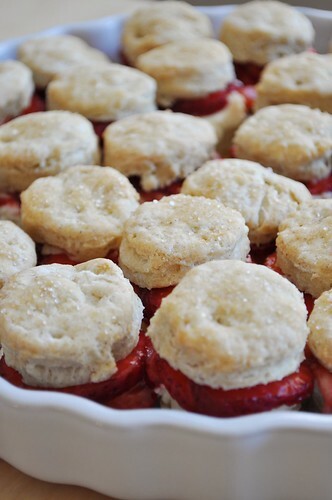 When you start thinking about larger summer gatherings, though–ones that involve mingling and standing and moving from one dip bowl to the next–a full sized strawberry shortcake seems like the wrong thing to plop down amongst all the bits and bites. The other issue with strawberry shortcake is the whipped cream. Whipped cream has a tendency to break down and get weepy if left out at room temperature for any significant amount of time. It’s not a problem if you’re assembling them and serving right away. When you’re bringing something to a large gathering, however, it’s nice to be able to show up with a pretty, put-together dish–and one that doesn’t have to take up a ton of space in your host’s undoubtedly already crowded refrigerator. Since we have close friends with a party-perfect terrace and remarkable social skills, and casual gatherings of Chris’ family often include grandparents, aunts and uncles, neighbors, family friends, and nearly a dozen children, I’m always trying to think up new, transportable dishes that can feed a crowd. The best way to make an iconic summer dessert fit right in with all the cookies and bars? Make it mini. I solved the whipped cream issue by substituting in a smear of sweetened mascarpone. The flavor of mascarpone is very similar to heavy cream, rich and milky, but it holds up in transit and has no issues if left out on the dessert table for a few hours. This Italian triple-cream cheese can pretty easily be found at most supermarkets these days. If you absolutely can’t locate it, regular cream cheese would suffice, but you won’t wind up with as true a strawberry shortcake flavor. They may look time consuming, but, especially if you make the biscuits a day ahead, they come together very quickly. Do it assembly-line style, one task at a time: split them all open, smear on the mascarpone, spoon on the strawberries, give them each a lid. They’re always a hit, and, if I do say so myself, they’re pretty much one of the cutest things I’ve ever seen. After preparing and kneading the biscuit dough per the recipe, gently roll it out to 1/2″ thick. Using a 1 1/2″ round cutter*, cut out as many biscuits as you can. Gather the scraps, roll the dough out again, and cut additional biscuits. Try to cut the biscuits as closely as possible; it’s best not to roll the dough more than three times as the latter batches of biscuits will become less flaky. 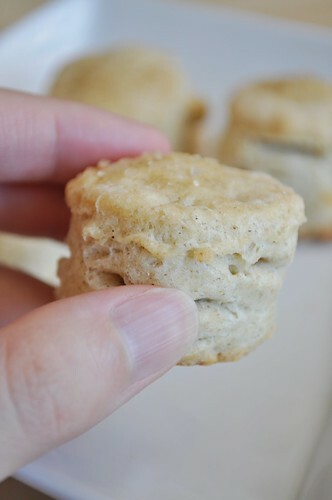 Place the cut biscuits on a baking sheet 1″ apart, refrigerating any that do not fit until you are ready to bake them. 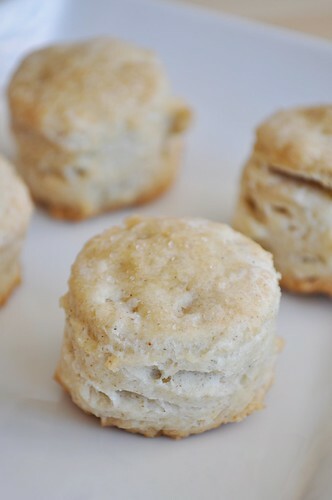 Brush biscuit tops with melted butter and sprinkle with raw sugar. Bake for 15-20 minutes, until lightly golden on top (17 1/2 minutes in my oven). Allow to cool completely. Can be made 1 day ahead. Place the sliced strawberries in a medium bowl. Sprinkle with 1 tablespoon of the sugar and toss to coat. Set aside. Spoon the mascarpone into a small bowl. Add in the remaining tablespoon of sugar. Combine with a whisk or using a hand mixer on low speed for 30 seconds to a minute. Cut all of the prepared biscuits in half, laying them open with the bottoms and tops side by side. 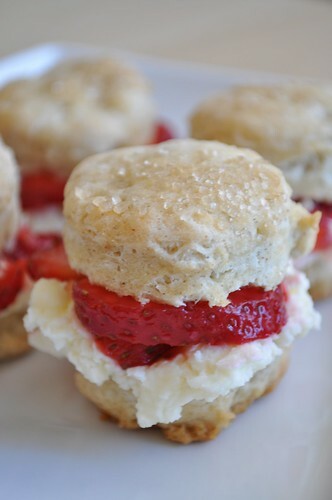 Spread a teaspoon of the sweetened mascarpone on each biscuit bottom. Next, carefully spoon about a teaspoon of the sliced strawberries on top of the mascarpone. 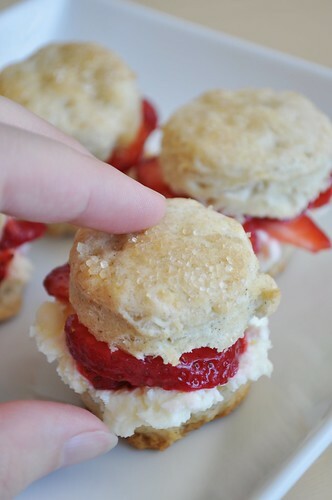 Finally, place the biscuit tops on each of the shortcakes, pressing down gently to secure. Refrigerate until you must transport or set them out. They will hold up for several hours at room temperature. Store any leftovers in the refrigerator. NOTE: You will likely end up with extra strawberries. Too many is better than too little though, and having some extra macerated strawberries lying about is hardly a problem. Oatmeal & ice cream are two excellent vehicles for these stragglers. *Alternatively, use a clean, circular object of the same diameter as a guide and cut using a sharp knife. I used a cap from a single serving sized bottle of soymilk.